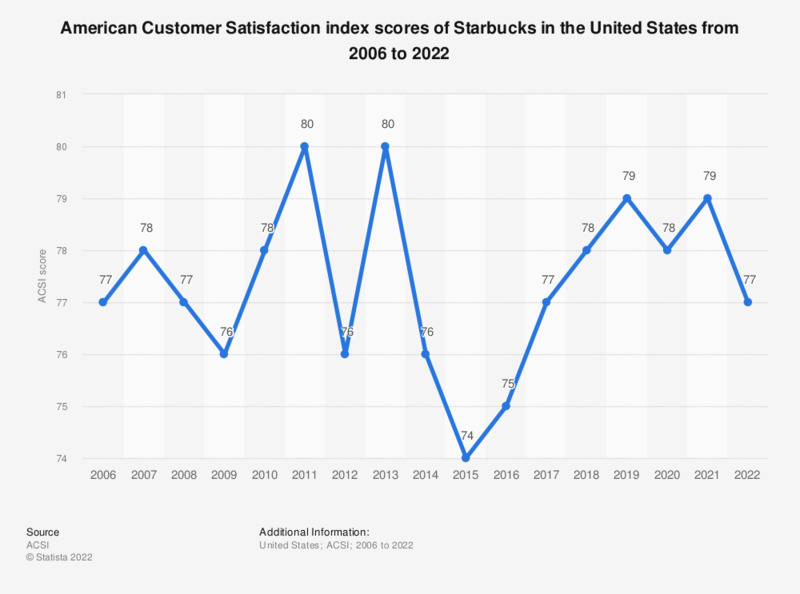 This statistic shows the American customer satisfaction index scores of Starbucks in the United States from 2006 to 2018. Starbucks had an ACSI score of 78 in 2018. The Starbucks Corporation is a coffeehouse chain based in Seattle which operates more than 27 thousand stores worldwide (as of 2017). Just over 50 percent (around 8,222) of all Starbucks stores were company-operated stores, from which Starbucks generates around 79 percent of its revenue. Around 5,708 stores are licensed stores. Starbucks, which became a publicly traded company on June 26, 1992, generated around 22.39 billion U.S. dollars in revenue in the 2017 fiscal year. In its company-operated stores Starbucks generates 73 percent of revenue from the sale of beverages, 20 percent from food sales and three percent from the sale of packaged and single serve coffees. Another four percent of retail sales are attributable to coffee-making equipment and other merchandise. The United States is Starbucks’ biggest and most important market. In 2017, revenues from Starbucks Americas segment amounted to more than 15 billion U.S. dollars. The Americas segment comprises over 13,000 stores in the U.S., Canada, Mexico, Puerto Rico, Brazil Chile and other American countries with around 86 percent of those stores located in the United States. Starbucks’ main competitors are quick-service restaurants and specialty coffee shops such as McDonald’s with it McCafé brand, Caribou Coffee or Dunkin’ Donuts. Since the coffee shop market is segmented and fragmented to varying degrees Starbucks faces differing competitors depending on the country / region of operation. In Canada for example the fast casual restaurant chain Tim Hortons, which operates over 3,000 stores in Canada compared to Starbucks' 1,460, is one of Starbucks’ strongest competitors. Everything On "Quick service restaurant brands: Starbucks" in One Document: Edited and Divided into Handy Chapters. Including Detailed References.